A little over a week ago, Tumblr user Kristine Harbek was hungry, so she decided to have a croissant. “But I better heat it up first,” she wrote. “Much yummier that way.” What followed was a slightly menacing series of images that is more fully experienced without further context. This post is pretty popular. Did it blow up instantly, and why do you think it’s gotten so much attention? It was pretty instantaneous. It’s basically a visual short story with plot twists. People respond well to things that are unexpected in an amusing and strange way, especially if the starting point is relatable. 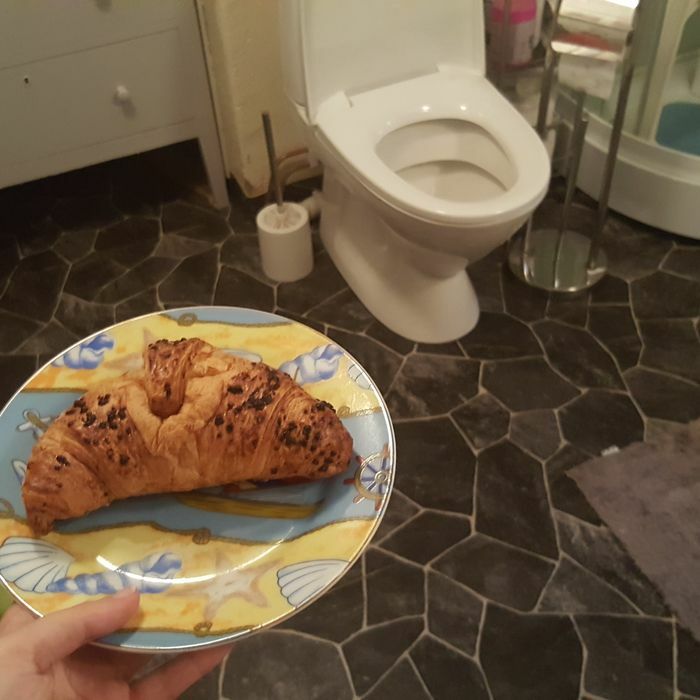 I’ve had multiple comments saying they thought the croissant was going to go in the toilet, but then the plot twists kept coming. Does all of the attention and curiosity make sense or is it weird? I’m just glad people like it! Making people smile is one of the best joys in life. I thought the post was funny, and I took the photos with a storytelling perspective in mind. It’s not the first thing I’ve done that’s gained this sort of widespread attention, so it’s not that weird to me. What surprised me more was the number of people who reached out to me about it, wanting more information, because this sort of thing usually quickly becomes fairly divorced from the original creator. Have Tumblr users been bugging you about it? Define “bugging.” I’ve gotten a lot of messages and replies, but very few of them have been unpleasant. I made some follow-up posts in response to them, for those curious enough to check out my blog. I’m an artist living in southern Norway, and until recently I’ve been at university, studying art, language, and narrative analysis. What is your house like? What’s its history? Well, I suppose I finally have to clear this up. It’s not my house; it’s a family cabin. It was built in 1934, and has had several extensions and additions since then. It’s one of several cabins in the area that have been split among my extended family. It’s a seaside cabin, so it’s filled with interesting old things. There’s a huge sawfish nose hanging on the wall. A piece of a sailing ship that my great-great-grandfather was the captain of. Huge crab shells and giant, opalized sea-snail shells. A small cannon mounted on the staircase. There’s a homemade board game based on a map of the area. On the beach there’s a huge harpoon gun and an empty, rusted sea mine. Honestly, the basement microwave is one of the least interesting things about the place. Why is there a trap door in the bathroom? The trap door came before the bathroom. Five years ago, that room was a bedroom. We only recently got hot water and plumbing there, and that room was the one it made the most sense to put the bathroom in. Why is there a microwave in the space the trap door leads into (as opposed to the kitchen)? You know what? I ask myself the same question. The simple answer is that there isn’t any room in the kitchen, and it’s not used often enough to take up space there. If it were my decision, I’d sooner have it in my bedroom than the basement. In one of my follow-up posts, I shared a photo from a few years ago of what the kitchen looked like before it was remodeled (at the same time the bathroom was built), complete with a stove from the 1960s, and at that point the microwave actually was in the kitchen! There’s also a well near the microwave. How did that come about? The cabin didn’t get running water until the 1970s, so that’s 40 years of no convenient fresh-water access. There was also a well outside, though that one has been filled up. I doubt it was ever used for drinking water, but for cleaning, the only other viable alternative is having a rainwater collector. Is there anything else you’d like to tell readers about your house or your lifestyle? For one of the follow-up posts, I had fun dragging the television and gaming console down into the basement, as well as some old family photos and plants, joking that it was actually my living room. And on a related note, if anyone wants to see what I draw — lately mostly things inspired by the game I was playing down there, Detroit: Become Human — there’s my art blog. Besides that, I think I’ve said everything I want to, and I hope I provided people with a laugh!